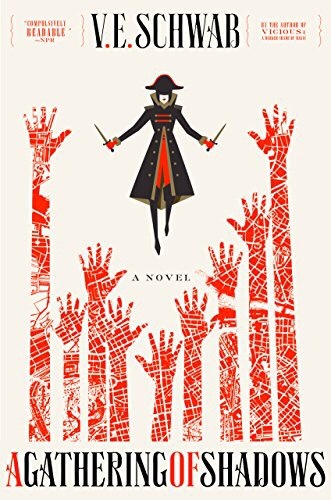 I was excited to finally get to A Gathering of Shadows, the second book in V. E. Schwab’s Shades of Magic series. I was fascinated by these worlds she has created with a series of London’s that went from no magic to full magic, colorless and colorful. There were moments of brilliance, but those moments were overshadowed by a dullness, my feelings mirroring her London’s spectrum of colors. I still really liked the characters. Delilah is a fascinating mix of distrust and curious cat. In A Gathering of Shadows she expands her knowledge of the magic she holds by serving as a pirate and tutoring under the captain Alucard. Alucard was probably my favorite new character in this book, his roguishness was charming and I couldn’t quite figure him out, which held my interest. Kell, stuck in London, held captive by his own spell tying he and his brother Rhy’s lives together, a tether that was necessary but now binds his adventurous soul. Maybe it was because of that tether thet the first half of the book was really slow moving and dare I say boring? Part of the fun of the first novel were his journeys, and there were only a couple of those in A Gathering of Shadows. Kell and Lila apart also made the story lack fire, noticeably, because when her ship finally docked in Maresh even the thought of the two of them spotting each other made me sit up in my seat scanning the pages for that moment. That moment did not disappoint. The latter half of the book made up for my lackluster feelings for the first. It was vibrant, exciting, and passionate! However, I can’t forget my struggle to keep slogging through the first half so I am giving this one only ❤️❤️❤️. Do you agree? What kept you reading this book? I’d love to hear about it in the comments below. ha, that’s a loaded question. I read the entire series, but it took a really long time for me to connect with the characters. It took me all the way to the third book until I really started enjoying the story as well as the cast. BUT I’m really glad I stuck with it. :D I’m currently reading her other series Monsters of Verity and enjoying it immensely. Have you read it yet? I haven’t read that series is it any good? I like it so much more. ;-) But I was told that that might be the case. It’s not as layered or complex as Shades of Magic. I felt like I knew everyone from the very beginning. The amount of characters didn’t feel overwhelming to me.